The German Research Foundation (Deutsche Forschungsgemeinschaft, DFG), the German Council of Science and Humanities (Wissenschaftsrat, WR), and the Joint Science Conference in Bonn have just announced that Universität Hamburg has been granted 4 clusters of excellence. An outstanding success for the University: all 4 of its cluster applications have now been awarded excellence status. Exploring fundamental and topical scientific questions and conducting world-class research: clusters of excellence are interdisciplinary and cross-institutional research collaborations in which numerous scientists and scholars focus on especially relevant related topics. That Universität Hamburg was granted funding for 4 clusters of excellence is a major achievement in and of itself; more astounding is this success with regard to the fact that Universität Hamburg’s applications were submitted as single institution applications and not completed within a university network. When the competition began, 195 applications were submitted to the DFG, of which only 88 advanced to the last round. 57 will be funded as clusters of excellence. In the next few days the DFG will inform the University of the amount of total funding. Examples include superconductors in certain crystals or the movements of molecule groups in proteins that lead to molecular recognition in biological processes. These special functions are not inherent in the individual building blocks. They only arise when the building blocks interact. To understand such complex processes, researchers in physics, chemistry, and structural biology work together. For their research, they can make use of internationally unrivaled infrastructure that has emerged in the last 10 years on the Bahrenfeld campus, especially the equipment that allows them to see the movement of atoms in real time. The researchers now want to discover the principles behind the evolution of special features and how to control them. This would enable us, for example, to develop new medicines, computers with enormous performance potential, or material for the loss-free transmission of electricity. A total of 160 people will work in the cluster, including researchers in the fields of physics, chemistry, and structural biology. To answer these questions, we need to know how people perceive climate change, what effective long-term decisions are being made, and how these impact and are impacted by the physical climate. There is a clear global climate trend. At the same time, climate variability is so great that the effects in some places seem milder than expected at first or even contradictory. This makes it difficult to make predictions and to motivate people to change. Furthermore, it is not just the climate that is so dynamic; societies change, too, generally and in some cases in response to climate change itself, which in turn further impacts the climate. The cluster’s climate research covers natural and societal aspects, and develops and reviews adaptation scenarios for sample cities and coasts. It yields important knowledge for policy makers and contributes to a purposeful climate policy. In addition to the University, the Max Planck Institute of Meteorology, the Helmholtz-Zentrum Geesthacht, and the Deutsches Klimarechenzentrum are participating. Climate research has proven than human beings contribute to climate change. The Paris Agreement has resulted in new challenges for scientists. Roughly 230 people from 15 disciplines (including oceanography, meteorology, biology, sociology, economics, humanities) are involved in the cluster. 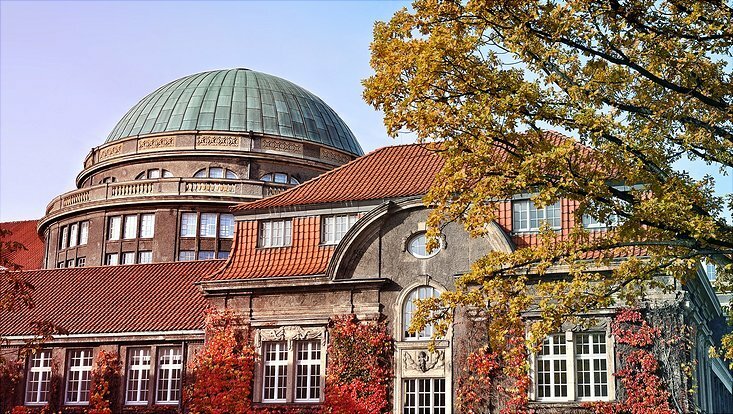 Participating institutions: Max Planck Institute for Meteorology, Helmholtz-Zentrum Geesthacht, Deutsches Klimarechenzentrum, 8 further scientific institutions—many of which are members of the KlimaCampus Hamburg. The discovery of the Higgs boson and the first observation of gravitational waves are among the most spectacular scientific achievements of the last several years. They confirm 2 basic principles of physics: the mass generation of elementary particles in quantum physics and Einstein’s Theory of General Relativity. Astrophysical observations, however, show that previous descriptions of nature are incomplete. Most mass in the universe consists of unknown or “dark matter” while anti-matter known from lab experiments does not appear in the cosmos. Furthermore, the observed accelerated expansion of the universe needs to be described using a new type of energy, namely “dark energy.” All of these observations are related to the physics of the Big Bang. Thus, the research team consists of leading scientists from the fields of mathematics, particle physics, astrophysics, and cosmology. The mysteries of mass and gravity will govern research in the coming decades. Roughly 400 researchers in mathematics and physics (particle, astro-, and mathematical physics) work in the cluster. Understanding Written Artefacts researches the development and function of written artefacts in manuscript cultures around the world, from their beginnings in ancient Mesopotamia to the digital era. The starting point is always the organic or inorganic written object consisting of hard or flexible material containing or bearing writing as well as traces of an object’s production, use, and, if applicable, conversion. The goal is to systematically record and examine the cultural diversity of written artefacts on the basis of their materiality. This will allow us, on the one hand, to recognize recurring patterns and, on the other, to document and preserve the diversity of manuscript cultures, especially in Asia and Africa. Fifty scientists and scholars from greater Hamburg pursue this research collaboratively. This unique cooperation between natural scientists and humanities scholars will investigate the phenomenon of writing from a global perspective for the first time. The team will also enjoy the support of an international network of experts.